Yes, today has seen the return of that most British of things, a strike, and it’s fair to say that it’s brought out the rueful humour of many of Twitter’s assembled wits. As reported by the London Evening Standard and other media sources, Tube workers have walked out over job losses and ticket office closures, reducing the Underground to a negligible service. Amid all of the political wrangling over the strike’s necessity or lack thereof (a bit tedious), social media users were productive with their comic gems in response to the massive disruption. Some workers last night were already contemplating the boasts with which they’d regale their colleagues once they did (somehow) get into work. There will be huge commuting one-upmanship on display tomorrow. Indeed, there was a lot of inventiveness with regard to how exactly they would complete their commutes. Come the morning, some of those who’d already dreamed up their no-show excuses found them to be a little bit thin. I told the boss I'd be late in because of the #TubeStrike - she pointed out I live here. Damn. However, not everyone lost out due to the strike action. Uber have made that much money from the #TubeStrike this morning that they're now plotting a bid for Alexis Sanchez. Whatever – there was no shortage of good old-fashioned British stiff upper lip. Colleague: how was your journey in? Well, maybe not everyone got that particular memo. Some social media users were actually impressed by the relative lack of disruption to their journeys. Others had the time to poetically contemplate the apocalyptic scenario before them. If all else failed, there was always the option for many users of just getting sloshed. OK, so what about the serious stuff? Behind all of the comedy, of course, there’s genuine anguish for many people who have seen their plans turned upside down by the strike. So, what do you need to know if you’re trying to get to and from work in the capital today? Staff across the entire network went on strike for 24 hours from 6pm on Sunday, with Transport for London (TfL) warning that “Tube services are severely reduced”, adding that even the stations that did open today would likely close by 7pm. TfL has urged those needing to travel to allow more time and avoid peak times if possible, as well as to consider other transport options such as buses, walking and cycling. As for the political fallout, well, as you can imagine, that has been considerable. 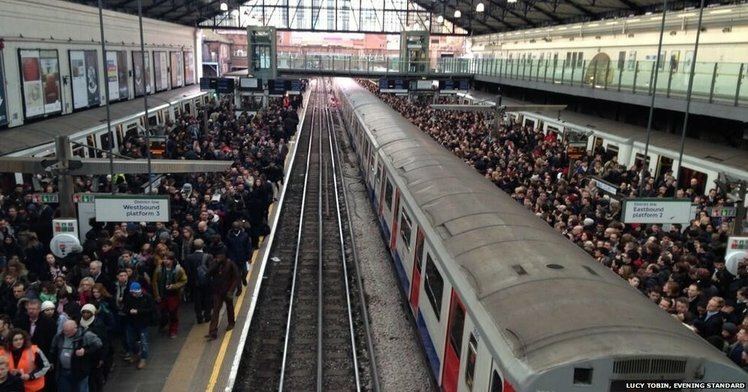 While London mayor Sadiq Khan described the Tube strike as “completely unnecessary”, RMT London regional organiser John Leach claimed: “You can’t carry a million people more each day with 834 fewer front line station staff”. The strike involves workers from both the RMT and the Transport Salaried Staffs’ Association (TSSA) unions. Whatever - we think everyone’s just about coping. It’s on days like these that you may be tempted to wonder whether you would be better off working remotely for a living. Dare we suggest a bit of matched betting via your laptop, in the comfort of your own home? Register with Profit Accumulator today and you may not have to ‘gamble’ (ahem) quite so often on the London transport network always being fully functional. As a matter of fact, matched betting doesn’t involve any gambling at all – it’s all based on mathematical equation, so you could be looking forward to an extra £1,000 to £2,000 in your bank account, every single month.